The Emerging Relationship between Distributed Energy Resources and the Transmission System. Many companies don't realize that they can generate their own power on-site and in a cleaner and more cost-effective way. Can Thermonuclear Fusion Be Used for Energy? Nuclear fusion has several advantages over nuclear fission. There are no carbon emissions. It is a very energy efficient system and provides abundant fuel. Reducing Wind Energy Costs through Increased Turbine Size: Is the Sky the Limit? Berkeley Lab study shows significant potential for further turbine scaling. Faster-responding storage allows us to operate the grid more efficiently, instantly balancing fluctuating supply and dynamic demand. Megan Treacy for TreeHugger: We've seen our share of interesting wind power designs, but often the technology can't come anywhere close to matching what the traditional horizontal axis wind turbines can do. There's a reason that when we think of wind energy, we think of giant masts with rotating blades and it's because that design is incredibly effective -- just look at Scotland and other areas around the world that now get a majority of their electricity needs from wind power. The European Commission Winter Package: One window open for renewable heat and solar thermal, Several doors closed for renewables and decarbonisation. 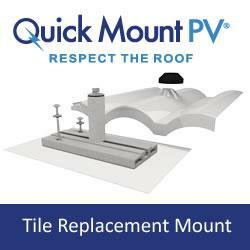 E-Mount features Quick Mount PV's patented QBlock Elevated Water Seal Technology to provide superior waterproofing and fast, single bolt installation on composition/asphalt shingle roofs. Similar to QMPV's best-selling Classic Composition Mount, E-Mount uses a smaller, lighter flashing and is priced to compete in highly competitive markets. All stainless steel hardware included. Made in the USA. Solar FlexRack, a division of Northern States Metals, is an integrated solar company that offers custom-designed, fixed tilt ground mount and single-axis tracking systems in the commercial and utility scale, solar mounting industry. Solar FlexRack also offers full turnkey packages, including engineering, geotechnical, pullout testing, field, layout, and installation services to address the actual site conditions of an installation, providing a full scope of services from design to delivery and installation. Solar FlexRack has completed more than 1 GW of solar racking installations in 32 states across America and five countries globally. AltEnergyMag is a community website where those of you who work in the Alternative Energy Industry are invited to contribute articles, news and product information for your peers to read and discover. Our philosophy is to create an outlet where the industry can report on itself. Please help us thank our sponsors and keep this resource free by visiting their websites and telling them you saw their ads at altenergymag.com.